Are your jeans a little snug today? You may be suffering from a term I call post holiday bloating. If you’re like me, you’ve spent the past few weeks at great parties with amazing friends and family eating too many carbohydrates and sweets and having one too many adult beverages. Sounds familiar? All is not lost, here a few tips on how to beat the holiday bloat, and get back into those skinny jeans before you’re singing auld lang syne on New Years Eve. Cut the carbohydrates. Eating carbohydrates causes your body to retain water, which ultimately gives you a bloated feeling. Remember that not all carbohydrates are bad for you, and a portion of your dietary needs should come from carbohydrates. Choose wisely by selecting fruits, vegetables and ancient grains. Stay away from white bread, pastries, cereals, and rich past and rice meals. Burn baby burn. If you’re in a part of the world with a milder climate, head outdoors for a brisk walk or run. If you live in cooler climate, do aerobics at home or hit the gym for a cardiovascular workout. Try to workout at an elevated heart rate for at least 30 minutes. Getting back into your normal workout routine (or choosing to start working out) will reduce the sluggish feeling you may have post-holiday. It will also feel great to sweat! Go Green. I love cleansing with fresh green veggies. My favorites are kale and spinach . Pick your favorite green vegetables, add your favorite fruit, and blend it into a smoothie. Click here for an easy not so green smoothie, green smoothie recipe. Drink water. Holiday meals contain a lot of sodium which leads to bloating. While you may not feel like drinking water, try to encourage yourself to have a glass every 3-4 hours. If you feel thirsty, you’re already dehydrated. Remember, your daily intake should be half of your weight in ounces. Love your gut. Consider taking a daily probiotic with digestive enzymes to get your digestive system back on track after the holidays. There are many benefits associated with taking probiotics including assisting with weight loss, stimulating immune response, preventing infections, decreasing allergies, and increasing digestive health. My favorite probiotic is probio 5. To learn more about it click here. Heat olive oil on medium heat. Add onions and peppers, and cook for about 5 minutes, until soft. Add garlic and jalapeno pepper, and cook for another 2 minutes, you’ll know good things are happening when you start to small the garlic. 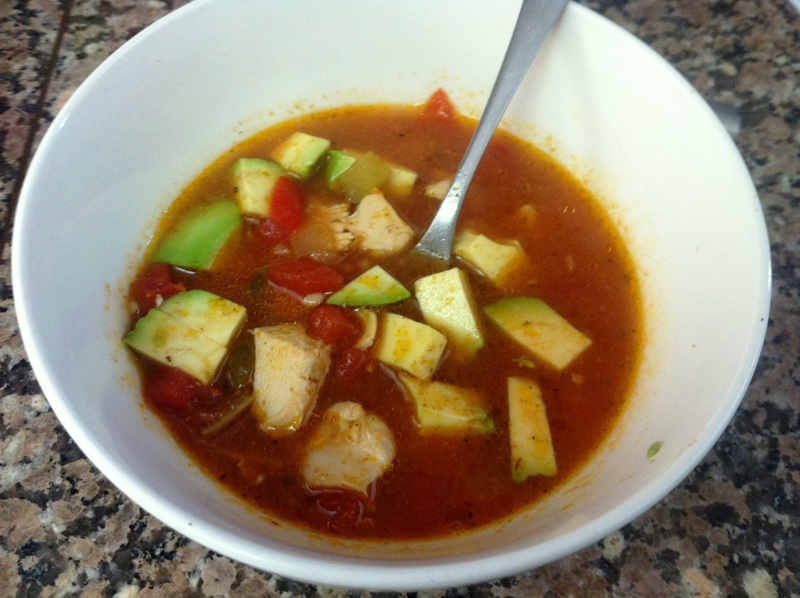 Add the homemade chicken broth, diced tomatoes, cumin, salt and pepper, and bring to a slow boil. Turn the heat down to a simmer (medium/low) and cook for 15-20 minutes. While this is cooking, it’s a great time to either put your boneless chicken breasts in the oven to bake, dice already precooked chicken (do not buy frozen precooked chicken or Tyson precooked chicken. I’m suggesting precooked chicken that you’ve cooked yourself), or debone a store bought whole rotisserie chicken. Combine diced or shredded chicken, and cook on low heat for another 10-15 minutes. Ladle into a bowl, and serve with your favorite garnishes! It’s really so ridiculously easy, and delicious on a cool night. Ole! I love taking trips, but I know it’s hard to stay disciplined when you’re not home and in your regular routine. Add the holidays to this equation, and your nutrition could get lost faster than luggage on a Delta flight. Go Nuts. I love almonds, pecans and walnuts, so I plan to pack an assortment of dry roasted and raw nuts. You can usually find individually wrapped packages of nuts. Try to stay away from sweetened nuts. Pack healthy snacks. My favorite snacks that travel well are Lara Bars, dried fruit and berries (my daughter loves this too), and Plexus 96 protein power (just add water when you’re ready). None of these items need refrigeration, and all will fit well in a suitcase. Fruit (and veggies) first. Many fast food restaurants, including Chick Fil A, McDonald’s and Subway, offer fruit as sides. When I’m dining out, I plan to order a side of vegetables with my meal, and stay away from “fried” sides. Drink Up. I plan to continue to drink half my weight in ounces of water, even while traveling. For road trips, I usually pack a small ice chest, and fill it with water bottles. When flying, I will purchase a flat of water from a grocery store after my arrival. Also, it’s so easy to get caught up in the travel and holiday cheer and overindulge in alcoholic beverages. For each alcoholic drink consumed, I plan to drink a full 16 ounces of water. Pack a refillable water bottle if you don’t want to purchase a flat of water. I love the Bobble brand water bottles. When eating out, try to fill your plate with a protein (meat or fish), 2 carbohydrates (vegetables or greens) and a healthy fat (olive oil on salad or avocado). If your hotel has a gym on site, try to get a workout in – even if it’s just 30 minutes. If you’re staying with family, go for a walk in their neighborhood. I’m taking a break from my usual recipe sharing and sugar bashing, to make a response in regards to a growing amount of “fat shaming” taking place in our society. Yesterday, I read an appalling story about a woman who willingly gained 50 pounds to prove to all the “fat people” that they caused this themselves and that losing the weight is easy if they’d stop being lazy. Wellness is a body, mind and spirit journey. Although someone may have the desire to lose weight and get healthier, I’ve noticed (in my own opinion) that people struggle most with weight loss when they can’t make the connection between body, mind and spirit. Overweight does not equal not lazy. I know some really hard-working overweight people. In fact, many of the hardworking people I know are overweight. Why is that? Generally, these people tend to take care of everyone else first, and have very little time or energy for themselves. It’s not just about food. Calories in, calories out; is completely outdated science when it comes to weight loss. For years, people were told expend more calories than they ate to lose weight. Hundreds of diets and weight loss companies were created around this idea. While that seems to make sense and in a perfect world it could work, there are several other factors to take into account including quality of calories ingested, hormones (major player), underlying health conditions and lifestyle. Get rid of the idea of skinny. Not everyone was intended was intended to have a size 26 waist or fit into a size 0, and that’s okay. Focus on what’s comfortable and healthy for you instead of trying to be something you think you should be. The mind is an incredibly powerful thing – especially when it comes to wellness. What we believe about ourselves, we become. If an overweight person, is constantly told or shown images through media that depict overweight people as “less than” because of a stupid number on a stupid scale, at least on some subconscious level that person will begin to believe it about themselves. Be thankful for the gift of wellness, and handle it with care. I believe that each and every person that reads this is called to a life of purpose. You have purpose and you are on this earth at this exact time for a reason. When we start to believe in that purpose, it becomes so much easier to put value on our life. Realize the value and blessing of having breath in your lungs, a heart that beats, the ability to move and walk, and be thankful for the gift of wellness. If you’re not well, find out what you can do now to improve your situation – whether it’s walking more or making better food choices. We were never intended to be enslaved to our situation. On a personal note, I apologize if any of my posts have ever seemed like self-righteous, fat shaming. I hope to leave any person that reads my posts feeling encouraged and motivated. Everyone can do something to improve their wellness, even if it’s just a baby step. Make that first baby with an attitude of thankfulness knowing that you CAN live a life of wellness. *To the person that gained 50 pounds to prove a really nasty point, maybe next time, just be kind and use your skill and expertise to encourage. Let’s be real, sometimes you can’t get around buying prepackaged food. Life is busy, and I understand (and know) the need for a quick food fix. In a perfect world, we’d all live off the land, but it’s 2014, and most of us are grocery shopping. If Oprah can have a list of favorites, I guess I can share my favorite “go to” items in a pinch. So while I’d love to slave over the stove for hours making the perfect pasta sauce (NOT! ), sometimes the jar sauce is just fine. And although grinding almonds in a blender to make homemade nut butter seems fun, I think I’ll take a shortcut and get mind from the jar. Don’t get me wrong, I do love making things at home, but sometimes (as in most of the time) a girl just needs a quick fix. *Disclaimer – I’ve read lots and lots of labels to come up with this list, but I urge you to do your own homework too. I have eggs every morning for breakfast, and once in a while, I like to add a little extra protein in the form of a meat or (very) occasionally a scoop of Greek yogurt. Pros: Available at Wal-Mart and most local grocers. 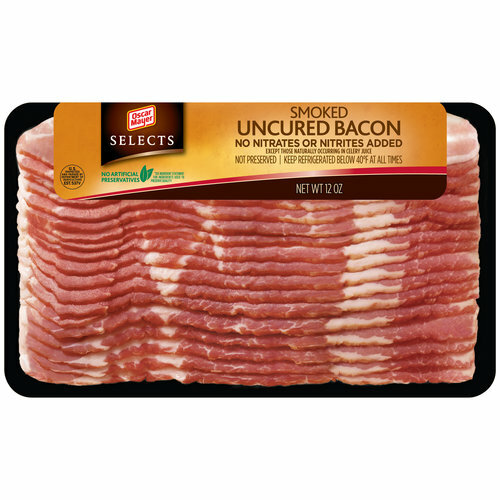 Cons: Are there any cons with bacon? I think not, I just don’t eat it everyday. It’s possible that the pigs may have been treated with antibiotics to control diseases or to speed up growth. Pros: Available at Whole Foods and some local grocers. 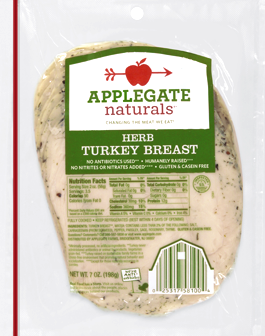 Applegate does not administer antibiotics to any of its livestock. Cons: More expensive than Oscar Meyer, limited stores carry the products. Pros: You can find a container at almost any grocery store. The yogurt is so creamy! Cons: A medium-sized container will cost you about $4. If you buy flavored yogurt, there will be added sugar. Stick to the “plain” variety, and add your own toppings. Pros: The meat is nitrate and nitrite free. There are no added sugars, and there are several ham and turkey options available. Overall, I think this is the best quality deli meat. Also, the meat is not slimy like other deli meats. Cons: Based on volume, it may be more expensive that other deli meat, and not every store carries the brand. 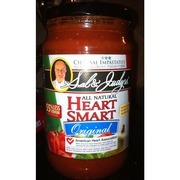 Pasta sauce is great to keep on hand for quick meals. Pros: You can find it at Wal-Mart. It’s generally less than $5 per jar. There are only 2 grams of sugar, and there is no added sugar. 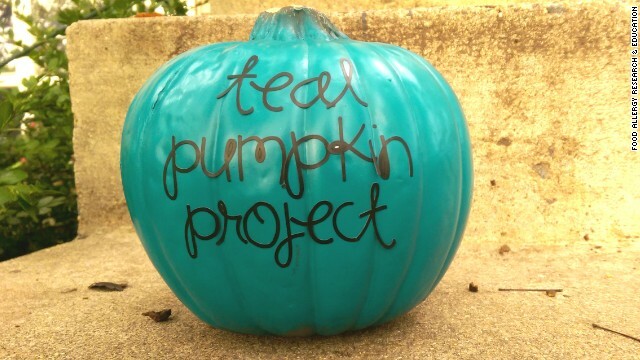 Cons: You may not be able to find it a grocery stores outside of southeast United States. 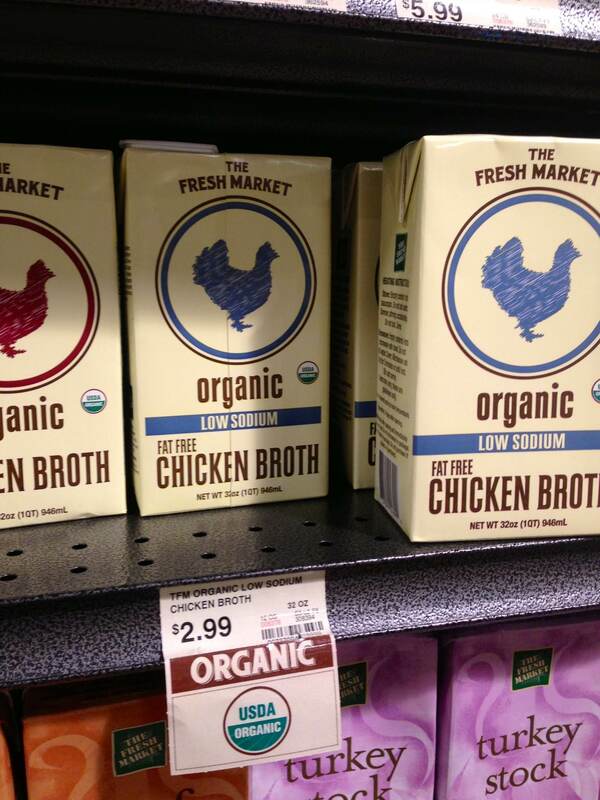 I use chicken and beef broth in a lot of my cooking, but I don’t always have time to make my own. This is a great substitute. Pros: Cost, it’s usually around $2.99 for one quart container. Cons: Fresh Market locations are generally limited to larger cities. Pros: I just found this butter a few weeks ago. 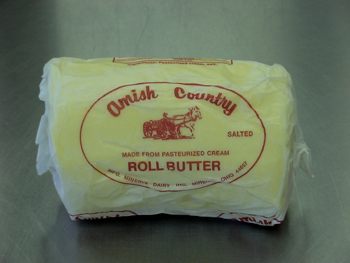 It’s more flavorful that regular butter. Not confirmed, but I have read that the butter comes from grass-fed cows. Also, the roll is huge, and could probably last you a few months depending on how much butter you use for cooking. Cons: Some associated grocer type stores will carry this item, but I’ve never seen it in a “big box” store. 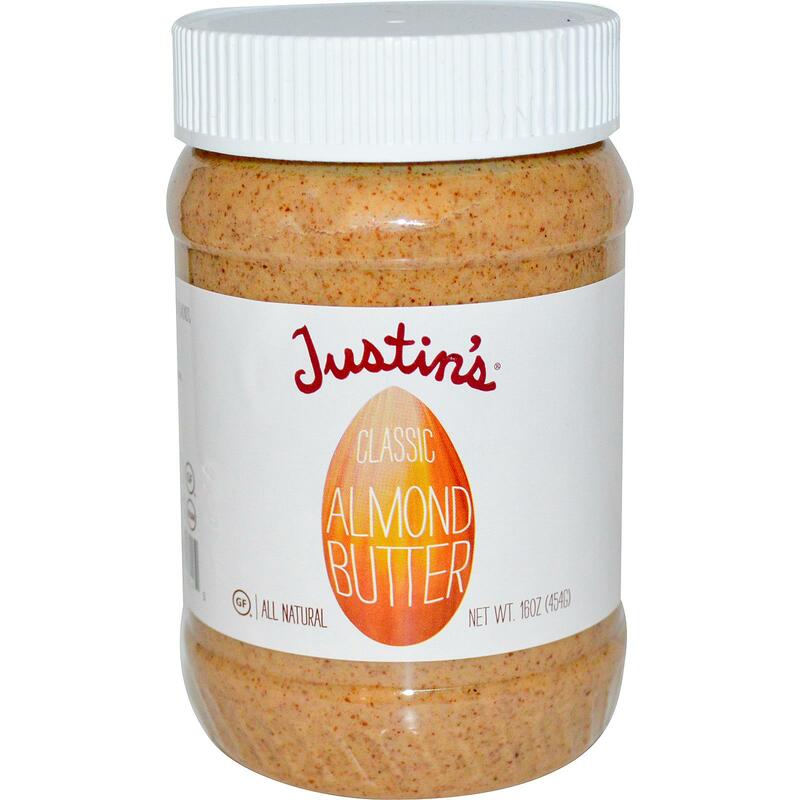 Pros: There are several flavor varieties available – I like the classic almond butter flavor best. It’s also available in big box retailers like Wal-Mart. Cons: The nut butter can cost upwards of $6; however; depending on how much you eat, it may last a week or 2. Brand: Lara Bar (I like the Peanut Butter Cookie and the Blueberry Muffin flavors). Pros: Non-gmo ingredients. No sugar added. 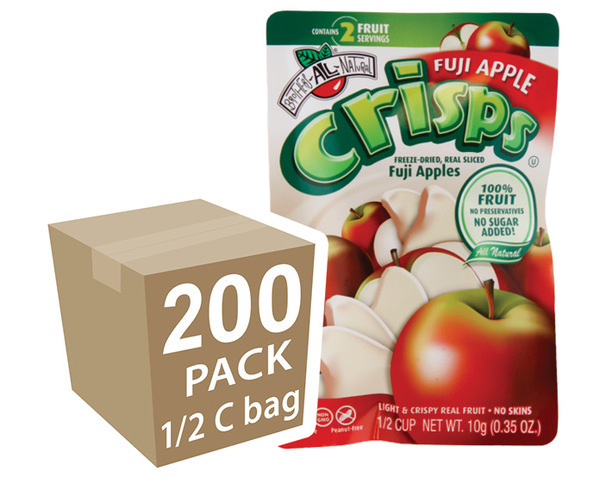 Great grab and go snack if you don’t have a piece of fruit or veggies available. Cons: The bars still have a high sugar content even though there is no added sugar. Pros: There is no added sugar, no preservatives, no colorings and no flavor enhancements. They are also allergy friendly since it’s made with just fruit. Yay! Con: The fruit is not certified organic. I use protein shakes for snacks (occasionally), or when I’m in a rush in the morning. Pro: It comes in a travel packet, so you can take it with you, and fix it when you’re ready. 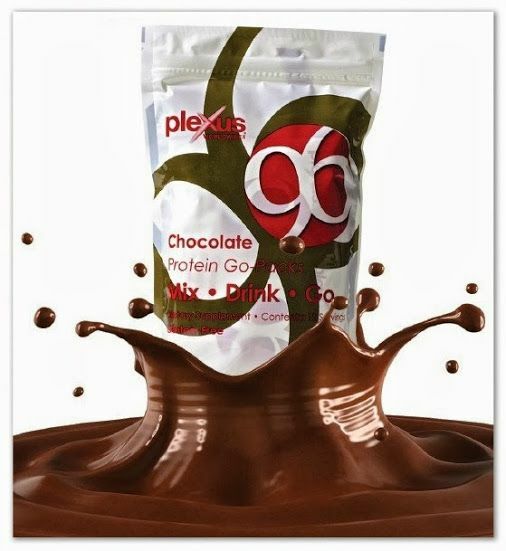 There are only 96 calories in the shake (if mixed with water). 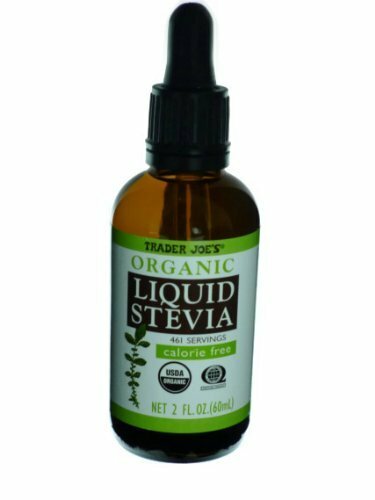 There is no added sugar, and it’s sweetened with stevia. Cons: If you have a dairy intolerance, there is whey isolate and concentrate in the drink. 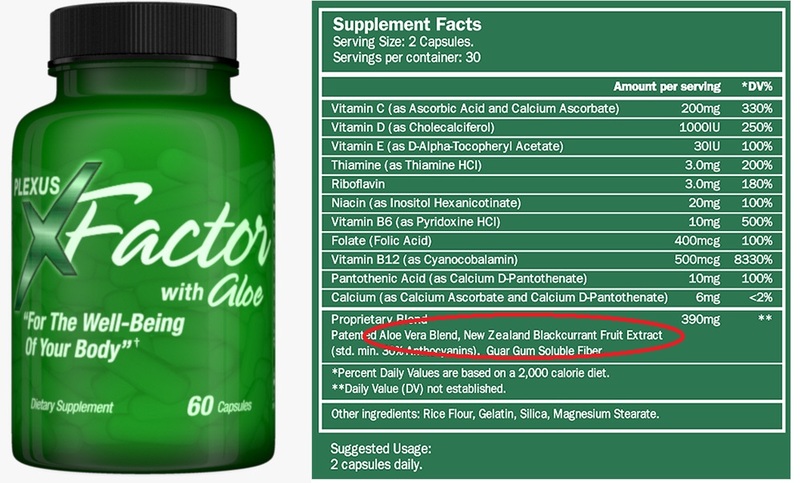 Pro: The protein is sweetened with stevia. The main ingredient is egg white powder, so it’s great for people with milk allergies or intolerance. Pros: $6.99 gets you 400+ servings. Cons: you may not have a Trader Joe’s store in your area. If you don’t have a Trader Joe’s in your area, the NOW brand is just as good, and you can order it online here http://www.nowfoods.com/BetterStevia-Extract-Powder-1lb.htm. Keep in mind that a little stevia goes a long way, proceed with caution. When the dog bites, and the bee stings, and I’m too busy to remember what to do on the never ending “to do” list… I simply remember my favorite things, and then I don’t feel so bad! October is Breast Cancer Awareness month. To find out how to get a free Breast Check kit, visit my website http://www.plexusslim.com/jadabruce. While you’re there, be sure to check out all the great products. Can you afford to eat healthier? Everyone’s busy, and almost everyone is on a budget. Meals need to be cheap and fast, but when we eat cheap and fast foods – it’s often not the best option. When I first started eating healthier, I would spend SO much money at the grocery store. Partially because I didn’t know how to shop and also because I didn’t have a plan. Can you relate? Do you find yourself running into your local health food store for just a few items, and $300 later, you’re scratching your head and wondering why you’re only walking out of the store with only 2 grocery bags?? That was me! I was so angry with myself, I’d drown my sorrows in a pint of ice cream (not purchased from the health food store). Eating healthy is expensive if: You do all of your shopping at Whole Foods (no hate against Whole Foods – I LOVE it, it’s just expensive!). You buy a lot of “healthy” prepackaged foods. You buy a ton of “health” foods then drive through McDonald’s everyday. You don’t have a plan. You let the food go to waste. Eating healthy is economical if: You have a plan. You cook your meals most of the time. You only buy what you need. You shop from your local grocer or farmer’s market. I’d like to share with you how I’m able to feed my family on $100 per week. I know what you’re thinking… Yes, I only have a family of 3; however, out of the 21 meals eaten per week, my daughter and I eat 19 of those at home (plus snacks) and my husband eats 15 meals at home. $100 for 1 week of healthy groceries. Have a plan. Take a few minutes to scan cabinets and the refrigerator. Look for items that are running low or items you have run out of (milk, butter, etc.) . Throw out anything that is old, rotten or expired. Plan a menu rough draft. Saving money requires some planning, but once you do it a few times, I promise it gets faster. I can usually prepare a menu and grocery list in about 20 minutes. When brainstorming a menu, think about a few things: How many things can you pre-cook for use later in the week? What will be good served as leftovers? What freezes well? How many servings will I need? 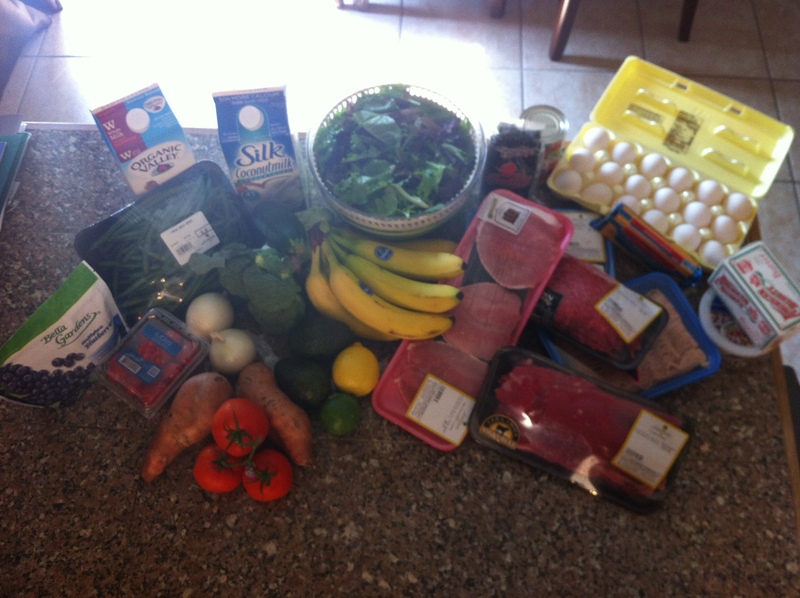 To see how I used my groceries, check out my one week menu plan. * Only buy what you need for one week of meals, unless there is a great sale – then stock up if you know you will use it at a later date. Shop the perimeter as much as possible. The aisles are a distraction, and most of the unhealthy, processed foods are located down the aisle. Stick to your list. When I don’t stick to my list I spend more. For instance, my bill was $113 because I bought a snack for my daughter and my husband (which were not included on the menu this week). Be quick. When I take a leisurely stroll through the store, I buy everything I see. Get in and get out! Keep a rough running tally. You don’t have to go through the store with a calculator, but keep a running tally in your mind. For instance, I know (roughly) 60% of my grocery budget will be spent on protein/fat (meat, eggs, nuts, butter/oils), 30% will be spent on veggies and fruit, and the rest will be spent on odds and ends (like new spices, dry beans, milk or an occasional canned item). Don’t buy junk food. 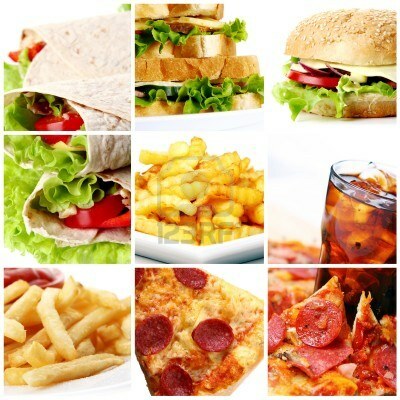 Although it may look cheaper, junk food has little to no nutritive value. This means, you’ll be wanting more soon after you eat it, which will make you buy more, and in the long run, I promise you are spending more money. Go for whole foods. Do you know your food’s origin? I can look at a green bean and know it came from a bean stalk. If you look at an Oreo or a hot dog, can you clearly tell it’s origin? Avoid frozen dinners. 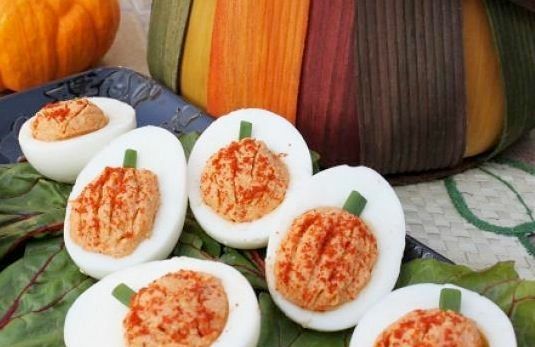 These are not healthy and full of sodium. Buy organic (when you can): If you’re going to eat the leaves or the skin, buy organic. If you’re going to throw away the peeling, save your money. Stay away from preservatives, sugars and additives in all other items purchased. Wash and pick up fruits and veggies. I store these in clear containers that are easy to see. If the veggies and fruits are in plain sight, I’m more likely to eat them. Store meat that won’t be used within 3 days in the freezer. We have a 3 day rule in our house, some people choose to keep meat in the refrigerator longer with meat, and that’s okay 🙂 Do what works for you! I do not coupon! I wish I did, but I don’t. I have a difficult time finding coupons for whole food items. I occasionally use coupons for home goods. I don’t always go to the same grocery store. I generally will go to the most conveniently located store with the best prices. I prefer to get my produce from the local Farmer’s Market. Produce purchased directly from the grower is usually cheaper and lasts longer than produce purchased in grocery stores. *One of my meals used shrimp. I purchase shrimp wholesale for $4 per pound. *** The bananas and blueberries are my little girl’s “go to” snack foods. How much do you spend on groceries per week? I’d love to hear about it!! Are you ready to jump start a health and wellness plan for your life? Click here! 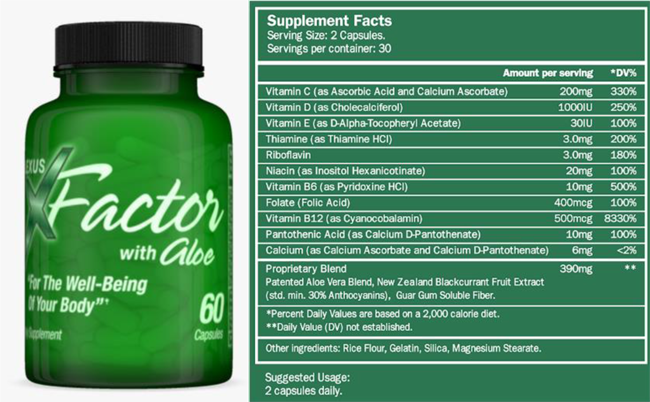 for healthy weight loss, cleanses, vitamins, pain management and breast health products! I’m cajun. Not the pretend kind of cajun that claims the heritage becuase they spell words like “go” with an “-eaux”. I’m the real deal – born and raised on Bayou Lafourche. I spent most of my childhood hating the place, but now that I’m grown and gone, I’m very nostalgic about certain things. In the Cajun tradition, three things are very important family, faith and food. They’re all intertwined and revolve around each other. Every Sunday, after church, everyone gathered at Maw Maw’s house for lunch . When you arrived, you were typically greeted with smells of gumbo roux, roast, fried chicken and cake. An average Sunday dinner consisted of gumbo and rice, roast or beef stew, fried or baked chicken, potato salad and cake (this is why it’s called Sunday dinner, you eat a noon, and are full until the next day.) You had to fill your plate with one of everything, and it was offensive if you only served yourself once. After lunch was family time, in the fall and winter we watched football, in the spring and summer we played outside before slipping into a carbohydrate/blood sugar coma. This tradition is still preserved in my family. Almost every Sunday we gather at my mom’s house after church, we have lunch (albeit, a much smaller version of what Maw Maw used to cook), spend the afternoon together, enjoy each others company, and occasionally slip off into a carbohydrate coma – Sunday is most definitely cheat meal day. Occasionally, I get to host Sunday dinner, and when I do, I like to try to impress my family. This past Sunday, I was lucky to host my brother and his lovely girlfriend, and in honor of the New Orleans Saints season opener against the Atlanta Falcons, we ate roasted dirty bird (turkey breast). 1 turkey breast (thawed and sliced into cutlets). From a safety standpoint it is best to thaw turkey breast in the refrigerator for 24-36 hours. 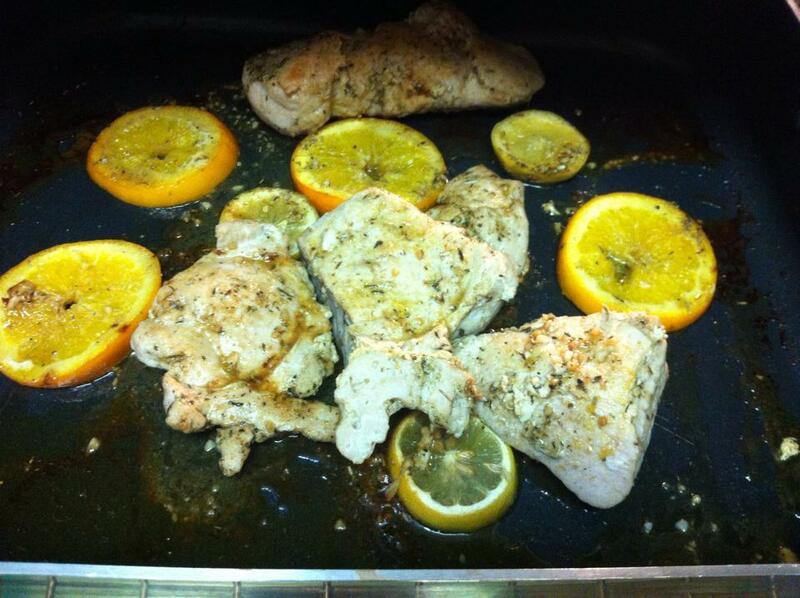 In a roasting pan, place the slices of orange and lemon on the bottom of the pan. After the turkey breast is thawed and sliced, placed the slice of turkey on top of the citrus slices (you don’t have to be perfect, just lay them on top). Melt butter, ghee or coconut oil. After melted, add olive olive, seasonings, and garlic. Stir to mix well. With a basting brush, brush the turkey cutlets with the seasoning mixture – reserve any leftover mixture. Bake for 40 minutes. Remove pan from oven, flip cutlets over, baste with any dripping and leftover seasoning mixture, and place pan back in the oven for 20 minutes. After 20 minutes, remove from oven. Use a meat thermometer to check the internal temperature – which should be 165 degrees. I’m really picky about turkey, because I often find it to be too dry for my liking. This turkey is not! 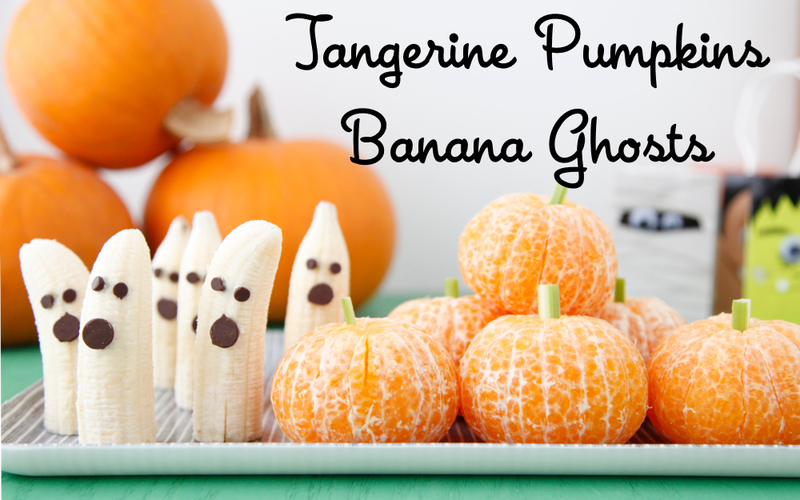 It’s so yummy, and a great fall meal since citrus is in season. We served the turkey with oven roasted veggies (brussels sprouts, broccoli, carrots and onions – all fall veggies) and salad. Unfortunately the Saints lost, but the bird was good!